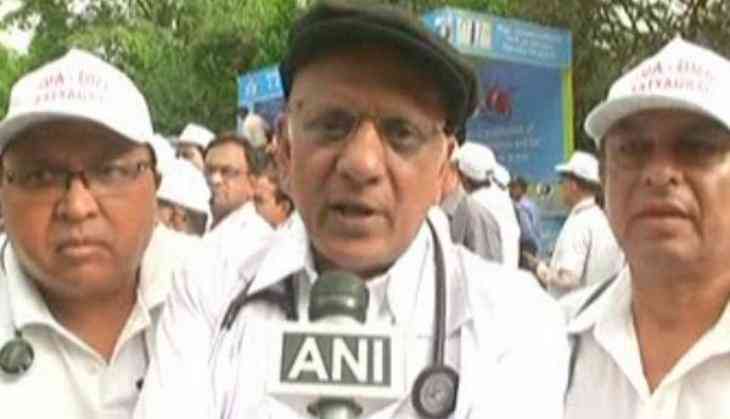 The Indian Medical Association (IMA) on Tuesday said that they are set to stage protest in Delhi today against the 'atrocities faced by the medical fraternity'. "We are observing 'satyagraha' today where our basic thing is atrocities faced by the medical profession. We need free mind and protection to treat the patient. We want autonomy of medical profession and education," IMA President K. K. Aggarwal told ANI. The association is organising 'Dilli Chalo Movement' today in which more than one lakh doctors from across the country from all states will be connecting together digitally and physically. The protest march would start from Rajghat and end at the Indira Gandhi Indoor Stadium. A signature campaign would also be launched by the Association on social media urging all doctors to collect thousands of signatures which would be sent to the Centre seeking action. The protest aims to address various demands of the medical fraternity including a stringent central act of violence, capping of compensation, single-window accountability with no criminal charges on doctors without intent to harm a patient and single-window registration of doctors and medical establishments. "We will deliberate on issues faced by the medical profession. We are not against accountability but nobody can take law in their hands. Clerical errors cannot be penal provisions and there has to be capping of compensation, single window registration, single window accountability. There are a lot of issues which we want amendments in like PCPNDT, consumer protection and clinical establishment Act," he added.